Okay, well, sort of. If you follow me elsewhere you may have noticed I've been sharing evidence of my latest obsession. While already a self-described "dance enthusiast" in a more passive sense, I recently became interested in learning the choreography to some of Britney Spears' songs. I don't know why, midlife crisis maybe? Why waste time trying to answer that question when I could be dancing? I figured there must be some video tutorials out there, right? I've only tackled one so far: Brian Friedman's choreography for "I'm A Slave 4 U", as seen performed by Spears, of course, in the video for the song. This uncut version is on her collection of videos (which I own, obviously). Say what you will about her singing, but girl can dance. This is one take, people. Anyway, here we are practicing, kids more or less cooperating in the background. Why time-lapse? Well, one answer is that we are practicing the tutorial (I'll get to specifics in a sec), which is over 10 minutes long. The time-lapse version is under a minute. Another answer, and this may explain why I continue to document myself dancing in time-lapse mode, is that my dancing, for now, looks better sped up. Don't worry. I'll post some regular videos at some point. Ironically, here I am dancing with my kid when adults dancing with kids is the primary reason I'm abstaining from SYTYCD this season. Indeed, #danceswithkids is kinda my new thing. But I'm a mom and an amateur, you know? And I'm not pushing my kid to compete, I'm selfishly more interested in learning to dance myself! As I’ve mentioned more than once, juggling kids and creativity with the need to make a little cash is challenging, to say the least. But there is one small advantage to having less time to make art: I have plenty of time to think about and mentally edit current projects while I’m wrangling kids, between the elusive and fleeting moments of productivity. This frequent experience forces a somewhat impulsive and impatient person like myself to, as my coworker regularly reminds me, “hit the pause button.” Spending time at work and, more importantly, with my kids, also opens me up to sources of inspiration I might not come across otherwise, like the book that’s been on recent rotation in my toddler’s bedtime routine: The Caboose Who Got Loose. Katy Caboose is, simply put, disappointed with her life. She dislikes being jostled and bumped at the back of the train, not to mention the endless cloud of smoke caused by the engine up front. Her journey as caboose takes many turns and bumps that cause her near-constant fear and anxiety. But it’s all relative, right? Maybe she just needs an attitude adjustment. Indeed, one night at the train yard, her situation is put into perspective by the sad little shack of the switchman, who envies Katy and tells her that. Taken aback, she doesn’t have a chance to respond to the shack before being re-hitched to the train, but the experience gives her a new outlook on her lot in life, albeit only temporarily. 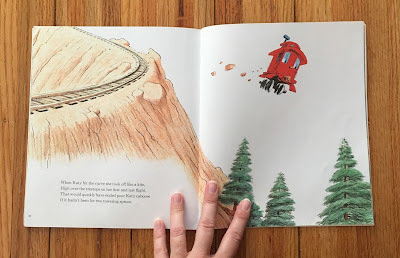 After a short time, she finds she’s still not happy being a caboose at the back of a train, wishing instead to be a tree, or a house, or a little cabin in the woods, with a view and fresh air. Simply put, Katy cannot deny her deep dissatisfaction, no matter how many sad, little shacks tell her she doesn’t really have it all that bad. I don’t want to give away the ending for anyone who hasn’t read it yet. It’s a great little read with wonderful illustrations by Bill Peet. I recommend you read it, even if you don’t have a kid to read it to. But I will say, following up on something I recently posted on Facebook about how disappointment gets a bad rap (courtesy of the always great Brain Pickings), that I can really identify with Katy at this particular moment in the book, conflicted between her overwhelming feelings of unhappiness, self-doubt around the legitimacy of those feelings, and the fear that comes with making a change. Disappointment is what we risk when we strive for more (not unlike the relationship between loss and love). And that striving is at the heart of what it means to be an artist. As Geoff Dyer writes in White Sands, “When I am no longer capable of disappointment the romance will be gone: I may as well be dead.” Indeed, I think it’s not only okay to admit disappointment but perhaps even embrace it as a catalyst for closing the gap between the work you do for pay and the work you do for love. And indeed, oh indeed, yes indeed I really do. At least, I hope that’s the case and that my story ends as satisfactorily as Katy’s, hopeful romantic that she is.